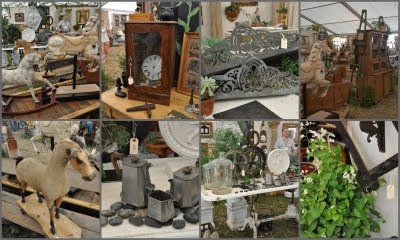 On opening day, Tall Husband and I headed straight for Found for the Home when we arrived at Marburger Farm Antique Show. Why? Because last year we got there on the last day of the show and Found had sold out! All Ruth Davis and Aaron Rambo, the proprietors, had left that last day were big smiles. After giving Ruth and Aaron hugs, we headed out to explore the rest of Marburger. Austin Woodhenge had wonderful artisan things. 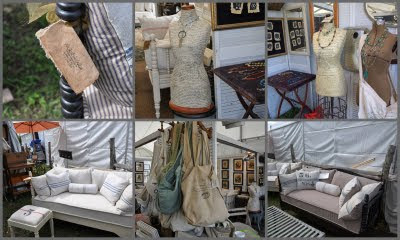 Just look at those wonderful dressmaker's forms, the linens and postal bags they silk screened with antique French sales receipts. We brought one of those bags home! Ahh, Magnolia Pearl! How could one live without your romantic Victorian funk? 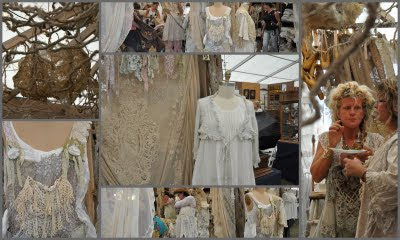 That white dress in the center is now hanging in my closet along with last year's Magnolia Pearl pantaloons and blouse. Tall Husband loves being at Magnolia Pearl, enveloped by the whole girlie flurry of excitement. 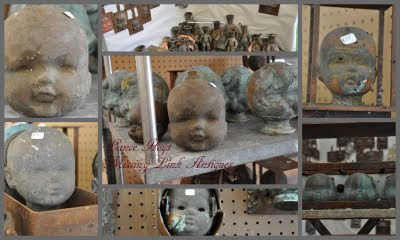 These old molds at Lance Hoyt's Missing Link Antiques (315-676-5638 in Brewerton, New York, USA) from a doll maker's factory have a new life as sculpture. I wanted them all. But after shopping at Magnolia Pearl's...If I had real money, I would be dangerous! January 27, 2010: Kim now has a blog: http://kimhoeggerhome.typepad.com/my_weblog/. Tall Husband and I wanted to move into Gerry and Doris Young's booth, which was filled with French, Belgian and German treasures (Weinbrenner & Co. Their e-mail is gerryyoung5@earthlink.net) While we were there we met Anne, who is the fabulous website designer for Installations Antiques. Also, friends, Jur and Becki, proprietors of Installations were there shopping. Come back later for one last look at Marburger Farm's Fall 2009 Show. You'll get to meet Zipper too! Oh, and be sure to click on photos to enlarge. What a magical place! That sure would have been fun to go to! Looks like a marvelous place to stroll around on a Saturday afternoon! Annie... since I couldn't go myself, your virtual visit is satisfactory today! what lucious photos... I hope to make it to Warrenton next spring... but for now... great bloggers sharing is the best I can do! thanks so much! what is the name of the plants in some of the photographs i have been trying so hard to figure out what the name of them are can someone help me out? Hello Annie! I was just updating my Google profile and entered my name in a search and came up on your site! 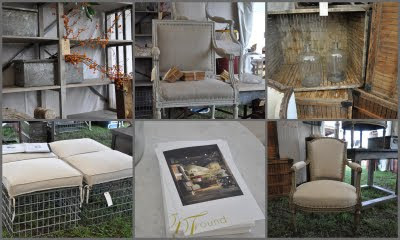 WOW, thank you for photographing and mentioning The French Pear Antiques on your blog. It is so neat to see the pics you have taken, Thank You so much! I wanted to leave you with my new contact info www.kimhoeggerhome.typepad.com so that those interested can find me. 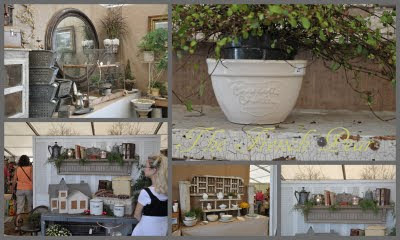 I will be showing at Marburger again this spring but under my new business name Kim Hoegger HOME, hope to see you there. Please stop in and say hello! Thanks again, love your blog!